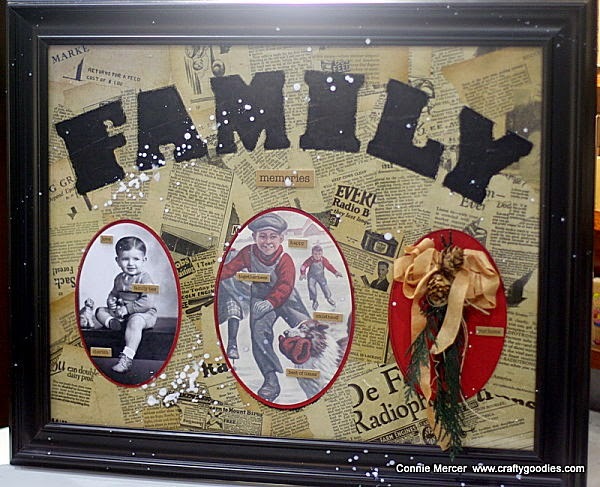 crafty goodies: Clear Scraps~Family Word Board! 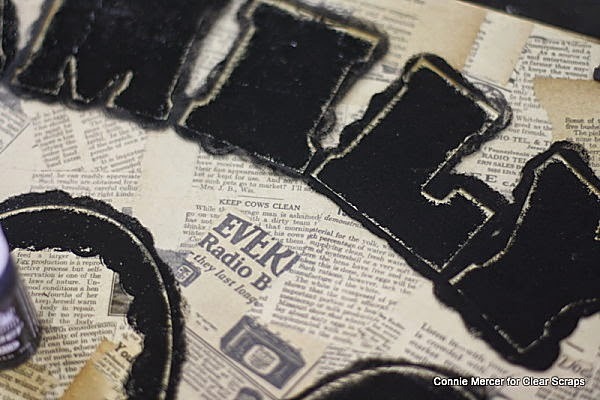 I have one of my projects I did for Clear Scraps, that went to CHA 2015, to share. 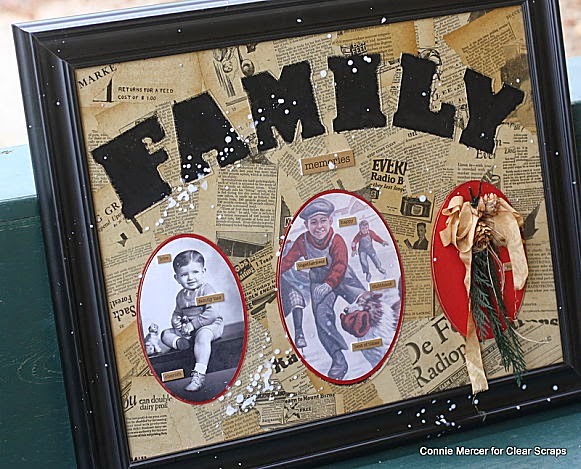 This project will be on the Clear Scraps label, when you buy the Family Word Board. 1. 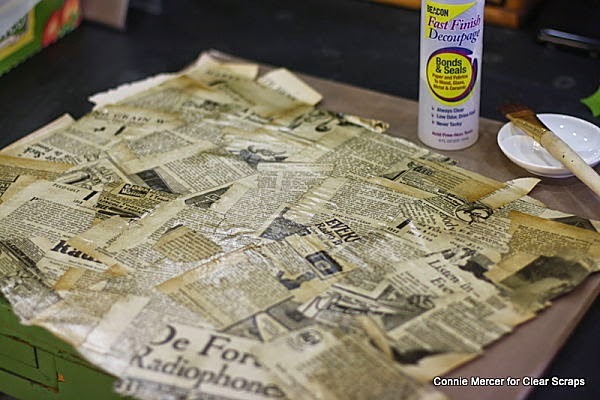 Cover the back chipboard with old newsprint using Fast Finish Decoupage by Beacon. 3. 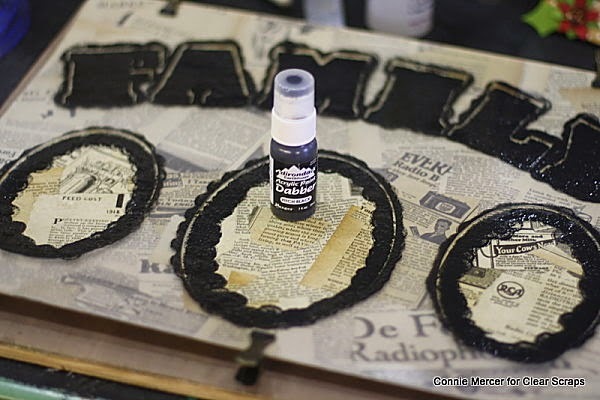 Sand edges of cardboard with sanding block, to remove any over hang of newsprint. 4. Leaving the plastic cover ON the acrylic, lay the acrylic (Family Frame) on the covered newsprint and use it like a stencil. 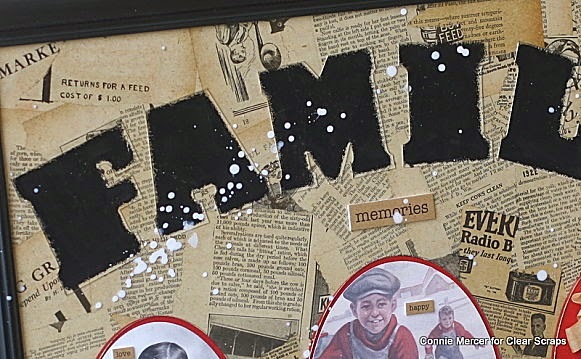 I used a flat sponge type applicator and black acrylic paint to shade in the word FAMILY and the ovals. 5. When the paint is dry, remove the plastic covering on both sides and you will have a clean, sharp line on the word and ovals. 6. You are ready to decorate each oval or add photographs. 7. I framed the complete project, treating the acrylic word frame as if it were glass. Perfect fit in a 11 x 16 frame. I speckled the frame with white paint for a snow effect. Another great new product from Clear Scraps! Check out the "What's New" page to see all the new products from Clear Scraps! Loveeeeeee this! LOVING how you created that background!!!!!!!!! I love that - the newspaper is the perfect touch! very cool frame.. love how you created that background.